In the United States, children lose vision from retinopathy of prematurity, strabismus (crossing of the eyes) and retinoblastoma (ocular tumor). Internationally, children are afflicted by these disorders, as well as by infections, such as onchocerciasis and toxocariasis, that can lead to blindness and nutritional deficiencies. Major advances have been made in each of these areas. Today, we examine premature babies soon after birth and watch for signs of the development of abnormal blood vessels. Laser treatment is applied promptly after these blood vessels appear, and most children maintain useful vision. Unfortunately, some eyes still progress to develop scar tissue and become blind despite laser treatment. Screening, optimal timing of laser treatment and preventative treatment of scarring and retinal detachment are important areas for further research. 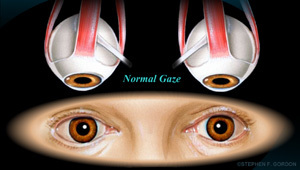 Illustrations above and below depict two forms of eye misalignment of the ocular muscles called “strabismus”. In this condition, both eyes do not view the same object at the same time. The abnormal deviation can appear constantly or in some cases, at intermittent times. When diagnosed in early childhood, it is an easily treatable condition with good results. If not identified and treated, a failure to develop vision results in lifelong poor vision in the misaligned eye. The treatment options include corrective eye glasses, corrective eye glasses with prisms, visual therapy and/or surgical correction. In the illustration above, one eye turns in while the other looks straight ahead. 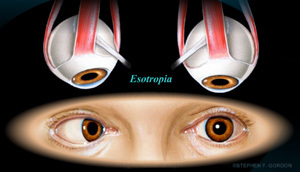 This is called “esotropia”. 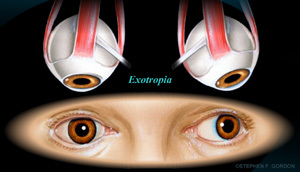 The illustration below, with one eye turning out, is called “exotropia”. Not illustrated is “hypertropia” – when one eye looks higher than the eye in a straight-ahead gaze. Also not illustrated is “hypotropia” – when the misaligned eye looks down while the other eye looks straight ahead. The illustration below depicts aligned eyes – both eyes look straight ahead, and both eyes view the same object at the same time. While uncommon, children can get intraocular tumors. Perhaps the most devastating is retinoblastoma, the most common intraocular cancer of childhood that afflicts approximately 300 children in the United States each year. Untreated, this is a fatal disease; but, if detected in time, more than 90% of children can be cured. Unfortunately, some children can have both eyes affected, which can lead to total blindness. Fortunately, recent advances in oncology and genetics have helped to limit some of the impact of retinoblastoma.